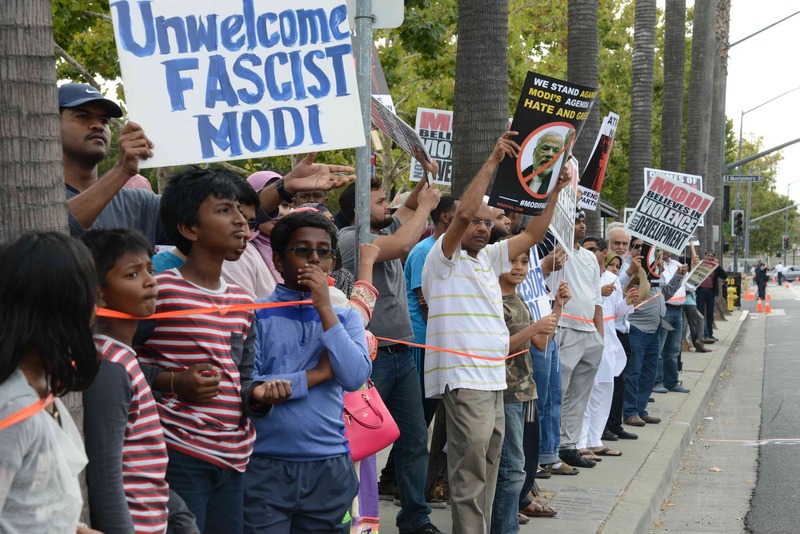 San Jose, CA: September 27, 2015: Passionate crowds of protesters greeted Indian Prime Minister Narendra Modi with loud slogans and a sea of placards upon his arrival at San Jose’s SAP Center for a stage-managed Silicon Valley “community reception.” The posters, chants, and surprise banner drop challenged the Modi PR team’s attempts to whitewash the controversial politician’s record. 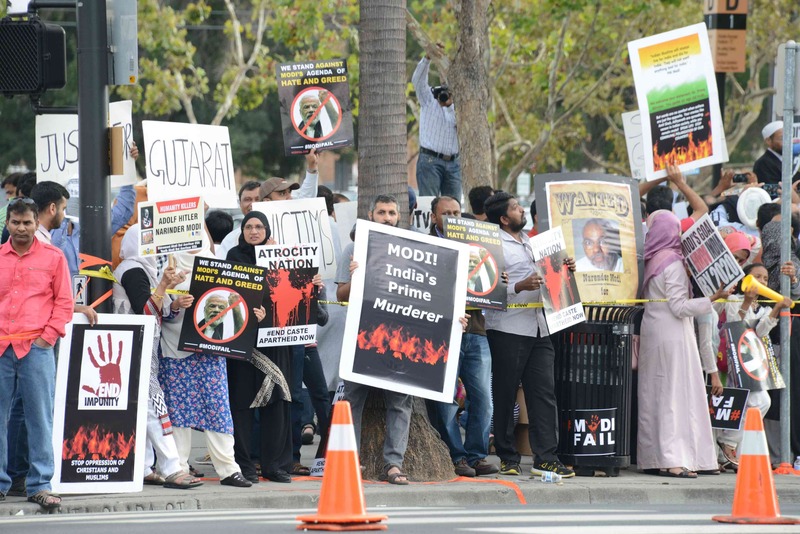 The protest was the culmination of a month-long campaign to educate Silicon Valley leaders and elected officials about Modi’s troubling human rights record. 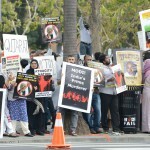 The Indian American community is sharply split on Modi’s performance during his first year in office, and that was obvious in the huge crowds of protesters filling up the designated protest zones and sidewalks in front of the SAP Center. 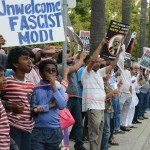 According to ABC7 News, police estimated the number of anti-Modi protesters at around 3,000. 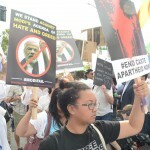 In addition to the Alliance for Justice and Accountability (AJA), a large progressive umbrella group, other groups also gathered in front of the SAP Center—most notably the Sikh community that showed up in large numbers. 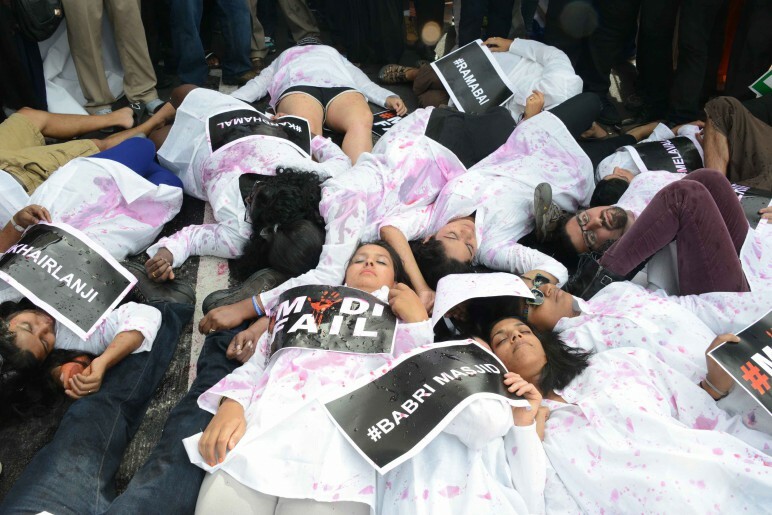 Protesters enacted a “die in” to dramatize the attacks against Muslims, Christians, Dalits, women, and other communities that are occurring with increasing frequency under the Modi administration. As in India, Modi die-hards threatened and attacked protesters, including Dalit and LGBTQ Indians, leaving them shaken. Congresswoman Zoe Lofgren, in whose district the event took place, chose not to attend. Congressman Honda, who has the largest number of Indian American constituents, issued a statement stating that he is “well aware of the controversy that surrounds Prime Minister Modi’s visit…I will neither overlook nor forget my duty to be a strong advocate for human rights.” Ro Khanna, who is running against Honda, issued a statement saying the US-India partnership “must be rooted in a respect for civic dissent, for human rights, for a robust public square that engages NGOs, and for religious tolerance and liberty.” AJA ran an outreach campaign to local elected officials, educating them on Modi’s failed civil rights record; many subsequently declined the Modi invite. Speakers representing the wide variety of groups in the alliance addressed the gathering and the media. They recounted the repeated and increasing violence visited upon India’s most vulnerable communities by Modi’s government and his supporters. 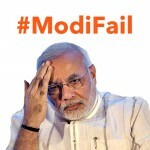 Protesters held signs, chanted, and connected with communities impacted by Modi’s regressive policies in India via social media. 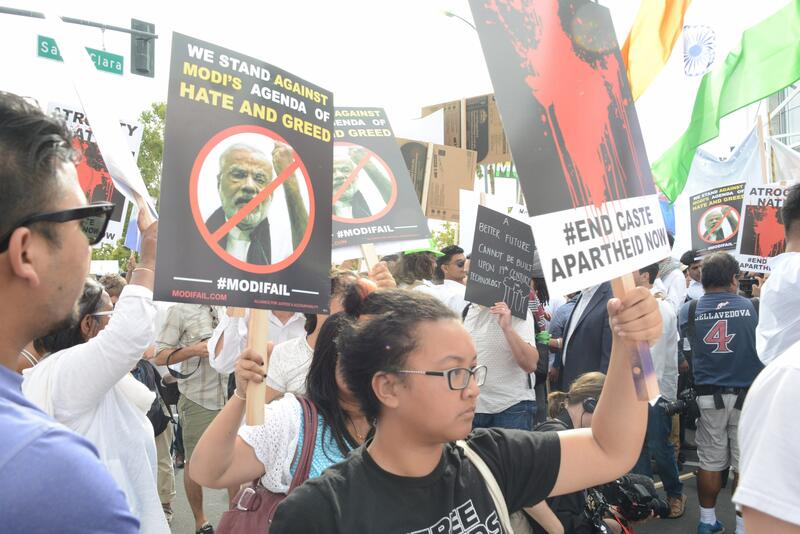 The die-in honored those who have lost their lives due to Modi’s policies, ranging from victims of the Gujarat genocide to the 100,000 Indians who die every year due to the dirty coal expanded by Modi. An actor donned a Modi mask to stage a mock trial, indicting him for his involvement in the pogroms of Gujarat in 2002. The Modi PR team announced to the media that they raised nearly a million dollars from companies wanting to do business in India, in order to whitewash his image with the SAP Center reception. AJA responded by launching a billboard campaign telling the other side of the story. 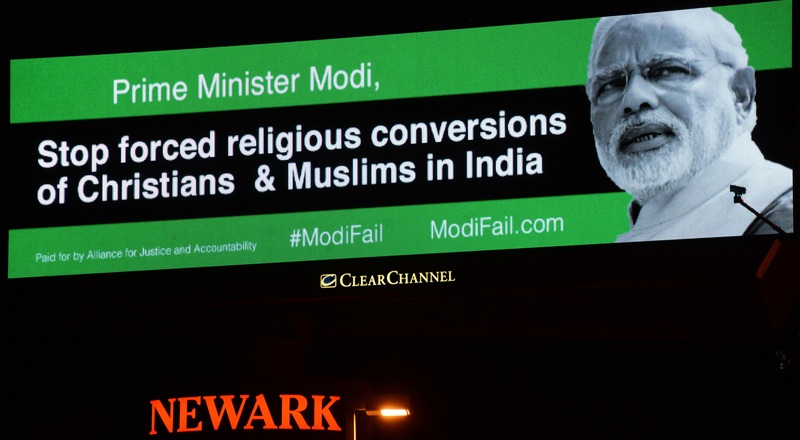 The billboards were linked to the #ModiFail campaign, which highlighted the gap between Prime Minister Modi’s words and his actions. 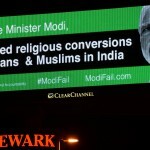 A week before Modi’s arrival, Silicon Valley residents started mailing packages of Purell hand sanitizer to Mark Zuckerberg, the CEO of Facebook, so he could wash off the stain after shaking hands with Narendra Modi, who was accused by Human Rights Watch of presiding over the killings of about 2,000 Muslims in 2002. Over 250 bottles have already been sent, with more pouring in; each package is dedicated to a named victim of the Gujarat pogroms. The Alliance for Justice and Accountability (AJA) is an Indian American coalition working to address attacks on Indian communities. We stand up for India’s religious minorities, women, LGBTQ people, marginalized castes, Dalits, and adivasis — as well as everyone who loves a safe and clean environment, free speech, digital freedom, and the right to openly debate and disagree.